SpinLife teamed up with Dr. Phil to customize a Quickie 2 for Joe. 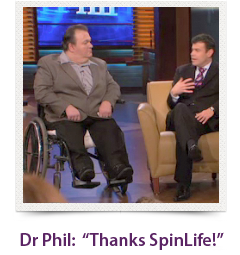 Joe, 45, came on the Dr. Phil show to heal 40 years of anger and pain. When Joe was five years old, a drunk driver ran a red light going over 120 miles per hour and crashed into Joe's family's car. His dad and sister were killed in the accident, and Joe was left paralyzed. Now, years later, Joe is still dealing with the emotional pain from the accident, as well as using a wheelchair that is over 10 years old and held together by bungee cords. At the end of the show, Dr. Phil offers Joe a new wheelchair, and that's where we come in. 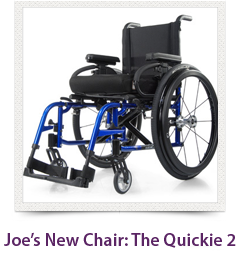 SpinLife customized a brand new Quickie 2 lightweight wheelchair for Joe. It folds for easy transport and weighs just 29 pounds, which makes it easier for Joe to self-propel. The Quickie 2 is very easy to adjust for a custom fit and its Q-Fit technology ensures a tight and secure fit for all components right out of the box. The Quickie 2 weighs just 29 lbs and is very easy to adjust for a custom, tight and secure fit right out of the box. 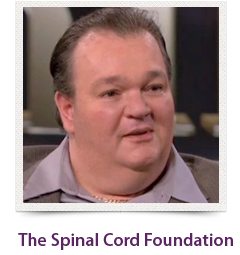 Joe founded The Spinal Cord Foundation, an organization that seeks to cure and improve the lives of those with spinal cord injuries.